The Braun Series 3 ProSkin 3080s (or simply the Series 3 3080 as it’s sometimes referred to) is the direct successor of the popular 380s-4. With the new Series 3 ProSkin being mostly a visual update of the older generation, the 3080s retains all the good traits of its predecessor and further improves things in the ergonomics and aesthetic departments. In this Braun Series 3 3080s review we’ll thoroughly test the razor to see just how well it performs and how it stacks up against other shavers from Braun and from the competition. Wrapup — Who should buy the Series 3 3080s? The 3080s includes most of the common features found throughout the Series 3 and also a few of its own. Let’s take a look at the most important ones. 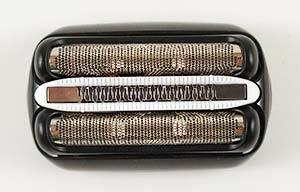 The shaving head of the 3080s is basically the same part found on the other Series 3 shavers, precisely the 32b cassette. 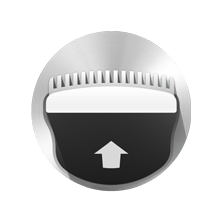 As usual, it features a middle cutter surrounded by a microcomb that should channel longer, flat-lying hairs into the trimmer. The two outer micro-foils are used for catching and cutting the short stubble close to the skin. The 3080s is fitted with a useful long hair trimmer that slides forward. Not all the models in the Series 3 ProSkin are fitted with a hair trimmer (for example, the 3010s doesn’t have one). We’ll see how good it actually is in the performance section. The bottom micro-foil can be lowered and locked into place by a switch located just below the shaving head. This feature should make the razor more nimble and maneuverable when shaving difficult areas. The 3080s is IPX7 certified and completely waterproof, thus making it suitable to be used in the shower or with shaving cream. Other noteworthy features are: 3-level LED battery charge indicator, 5-minute quick charge option, charging stand, travel case. Overall, the 3080s offers a pretty compelling package for an entry-level shaver. The 3080s is very similar to other Series 3 razors I’ve tested before, particularly the 3040s. It feels well balanced in the hand and it’s pretty lightweight despite its girth and chunky profile. The build quality is very solid with no visible gaps or cracking noises when held tight. The textured rubber material that surrounds a large part of the body ensures excellent grip even when it’s wet. The large rubberized ON/OFF switch can also be used as a rest place for your thumb during the shave. As far as visuals go, the 3080s looks the best of all Series 3 razors. The mostly black color scheme, along with the aqua blue accents make it look more stylish and more expensive than it really is. Another plus in the ergonomics department goes to the long hair trimmer. Its positioning is better than on most electric shavers and it also slides forward beyond the shaving head so you can actually see what you’re doing. The precision lock switch is only found on two shavers from the refreshed Series 3: the 3080s in our review and the 3090cc. When engaged, it retracts the front micro-foil and locks it into place. 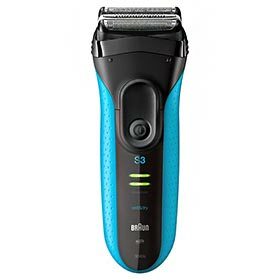 According to Braun, this feature makes the shaving head slimmer and more maneuverable, allowing you to only use the top foil for shaving tricky areas, like under your nose. In my opinion this feature is not of much use as the Series 3 has a very basic and already compact shaving head that doesn’t tilt or pivot; therefore, a locking mechanism doesn’t make much of a difference. As far as negatives go, the 3080s doesn’t have a travel lock. The 3040s for example comes with a plastic cap that also covers the ON/OFF switch. As we’ve seen in the direct comparison of the two, the 3080s doesn’t come with a protective cap. Instead, Braun has included a hard travel case. I don’t think this is a huge issue when traveling since the ON/OFF switch must be pressed very hard, so it’s unlikely to be turned on by accident. There is also an additional protection layer offered by the travel case. However, I do find it odd that Braun decided to skimp on including a basic plastic cap. The Series 3 3080s is fitted with a Ni-MH battery and can only be operated cordless. Unlike the dry only shavers from the series, it can’t be used while plugged in as a safety precaution. With a fully charged battery, it should provide around 45 minutes worth of shaving time. And in real life use it pretty much does and even manages to go a bit beyound that. Charging the 3080 takes around 60 minutes and can be done by plugging the cord directly into the razor or by using the included charging stand. This accessory is specific to the 3080s and no other model from the Series 3 has it. 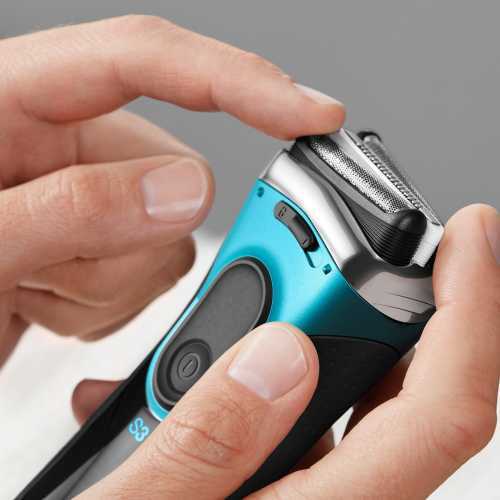 There’s also a 5-minute quick charge option that will give you enough power for a 3 minute shaving session. The LED display has 3 levels to indicate the remaining battery charge. When it’s almost drained the remaining bar will turn red to warn you that you need to charge the razor. It’s a very basic indicator that’s not particularly useful. The 3080s will also warn you to replace the shaving head (cassette) after 18 months. The warning light is located just below the Braun logo on the front and can be reset by a long press on the ON/OFF switch. 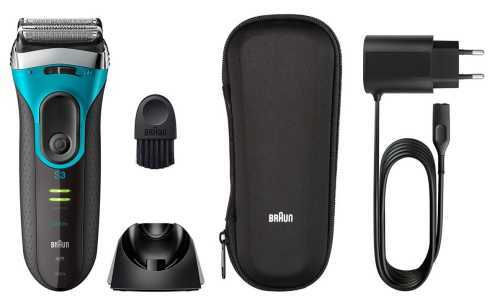 The Braun Series 3 3080s doesn’t come with a cleaning & charging station, so a manual clean is the only option. Other shavers from this line — the ones ending in cc — do come with one, but those are pretty pricey and in my opinion are not worth the extra money. An example is the 3050cc I reviewed here. In the case of the 3080s in this review, you can pop out the shaving head and gently tap it on your counter-top to remove the bulk of the hairs. Then you use the included brush to remove the hairs from the inner housing of the shaver. Do not use the brush directly on the foils as they can be easily damaged. Since the 3080s is fully waterproof, you can also rinse the shaver and the shaving head under warm tap water, then let them air dry before putting it back together. From time to time it’s recommended to use a bit of liquid soap for a more thorough clean. Pour a few drops on the foils, then let it run for 10-15 seconds under tap water. Remove the head and rinse it until all the foam has been removed. 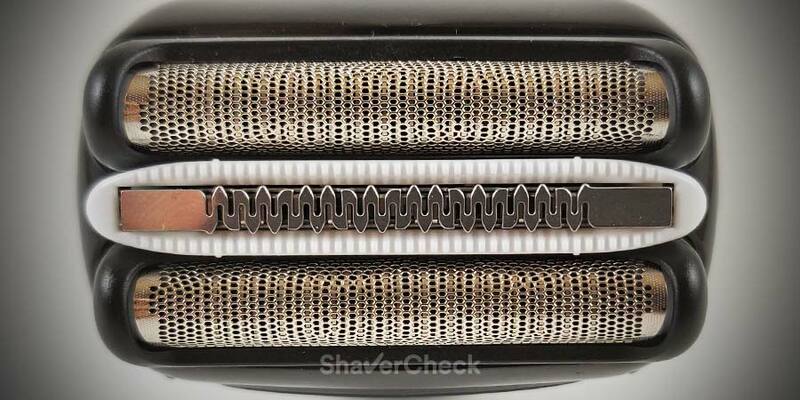 Braun shavers are usually more difficult to clean than other foil shavers (Panasonic for example) since the blades and the foils can’t be individually removed. Therefore, you must be more thorough to ensure proper cleaning. Make sure to also lubricate the shaver two times a week if you regularly use liquid soap for cleaning. After testing quite a few Series 3 in the past, the shaving performance of the Braun 3080s wasn’t much of a surprise for me. I can safely say that it is on par with the 3040s and the older 380s-4 it replaces. What does that mean? Well, it works very well for daily shaving, whether you use it dry or with shaving cream. It can even yield good results for shaving every other day or every two days if your hair isn’t very coarse. 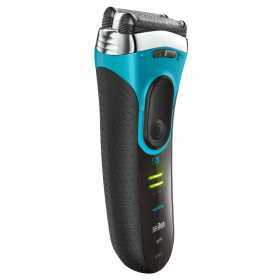 The comfort is excellent and the closeness is also quite good for a shaver in this price category. However, using it for shaving longer, flat-lying hairs will show its limitations. Here is where the difference between it and a more advanced razor (like the Series 7 790cc) is obvious. Despite having a middle trimmer with the specially designed microcomb, it just can’t shave as effectively longer hairs that lie flat on the skin, especially on the neck. If these hairs grow in different directions too, you’ll have to work harder and use more strokes for a clean shave and even then some stray hairs may be left behind. It’s still quite decent for a basic foil shaver and quite a bit better in this regard than a Panasonic Arc 3. Being an entry level razor, its motor is not as powerful as the one fitted on the more advanced Series 5 or 7 and can feel slow at times. 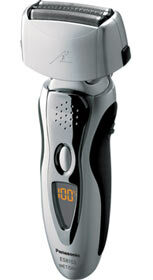 The long hair trimmer is excellent from an ergonomic point of view as it’s very easy to use. However, it doesn’t seem to actually cut the hairs as well and you often have to go over an area a few times in order to get all the hairs. The Series 3 ProSkin 3080s is quite loud during use; it has a raspy buzz that to me seems a bit louder than a Series 5 or 7. Sadly, Braun decided not to include a protective cap or a small bottle of lubricant. This is where the Series 3 excels. The 3080s uses the 32s/32b shaving head (cassette), also compatible with the older models from the Series 3, like the 340s-4 or the 380s-4. The recommended interval for replacing the part is 18 months, significantly more than the usual 12 months. Moreover, the shaving head is also very reasonably priced, meaning that the running costs for the 3080s will be lower. To summarize, the 3080s works great as long as you use it relatively often (daily or every other day). If you need a robust and efficient razor to be used in these conditions, the 3080 should do just fine. If you have very coarse facial hair or shave every two days or even more, then I highly recommend opting for a more advanced razor as the 3080s will feel underpowered and completing a shave will take a long time. The 3080s can be a great choice for beginners too as it’s very easy to use and the replacement shaving cassettes are inexpensive. The excellent comfort during and after the shave means that the 3080s is a suitable budget-friendly option for men with sensitive skin. The main problem with the 3080s is in my opinion the price. The Series 3 ProSkin line is aimed at the budget-conscious buyer and as you’ll see next, there are less expensive alternatives out there. This razor is the first obvious alternative. In fact, I highly recommend checking it out before buying the 3080s. While their performance is identical and the only differences are related to accessories, aesthetics and the (useless) locking mechanism, their prices can vary greatly, with the 3040s costing even as low as half the price of the 3080s. In this case, the 3040s is clearly the better option. In my opinion choosing one or the other should mainly come down to the price. In this price category, we also have Series 3’s direct competitor, the Arc 3 line from Panasonic. For example, the ES8103S is an older, reasonably priced model that is still very relevant today in the entry level segment. In fact, I personally find the Arc 3 from Panasonic to shave faster and marginally closer than the Series 3. They’re also easier to clean manually. At the same time, the Panasonics aren’t as comfortable, their blades are more expensive and don’t seem to last as much. Both have their pros and cons and it’s up to you to choose the one that seems to better suit your needs. I own a braun s3 wet&dry 3080s shaver Ihave it about 2 years .Trouble is the battery will no longer hold charge can I replace battery. The battery is not user-replaceable, it can only be replaced in an authorized service center. Theoretically, you could take the shaver apart and replace the batteries with identical ones if you have the necessary skills. However, I don’t think the risks and the trouble are worth it.